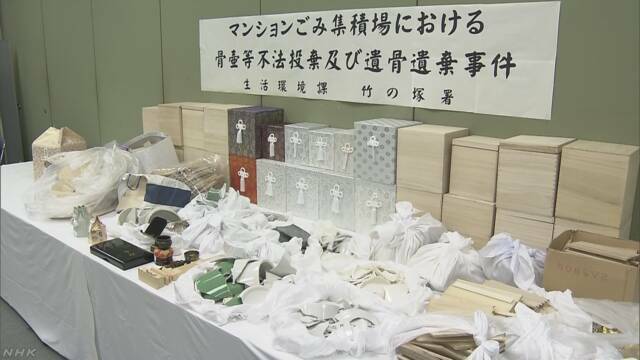 TOKYO (TR) – Tokyo Metropolitan Police have arrested a man tasked with reburying human ashes after he was found to have dumped them in the trash, reports NHK (July 19). 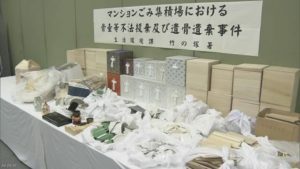 On nine occasions between January and June, Kazuhiko Kobayashi, 59, allegedly dumped human ashes and pieces of funerary urns at a garbage collection point at his residence in Adachi Ward. Kobayashi, who has been accused of abandoning remains and violating the Waste Management Law regarding illegal dumping, denies the allegations. “I dumped funerary urns, but I do not recall anything about ashes,” the suspect was quoted by police. According to police, Kobayashi is a contractor hired by temples and charnel houses to rebury human ashes. Beginning last year, an employee of the management company for the building became away of the illegal dumping and consulted with police. According to the Ministry of Health, Labor and Welfare, the number of requests for reburials has steadily increased since 2012, when the figure stood at 79,749. Four years later, it surged to 97,317.